The Jennings' Collection : J A S Jennings – Editor Of The Times Of Malaya Press Ltd.
Subject :The Jennings' Collection : J A S Jennings – Editor of the Times of Malaya Press Ltd.
John Arthur Stuart Jennings (more popularly known as Mr J A S Jennings) was born in Singapore, in 1879. He was the eldest son of the late Chief Inspector Jennings, of the Straits Settlement Police. Having completed his education at Raffles School, Jennings began his career with the Singapore Free Press - under the tutelage of the late Major W G St Clair. 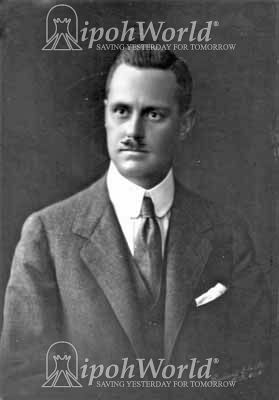 Jennings was one of the ‘most senior members’ (next to Mr J H M Robson) of a group of European journalists who worked in Malaya. He had a flair for reporting; and being in ‘close contact’ with those in the Singapore Crime Unit, inspired him to write a series of stories (which were published under the pen name of “Southern Cross”). In 1906, Jennings took over the Times of Malaya (from Dr R M Connolly). During his 30 years with the paper, Jennings fought long and hard to keep it alive; he even invested his own savings into the paper and later became the sole proprietor. The newspaper had literally become a part of him, but he had to slowly step aside when his health began to decline. This was when Jennings passed on some of load to his eldest son E L S Jennings. Besides being one of the oldest members of Lodge Kinta, Jennings was also into sports - like tennis, soccer and riding. When he was in Singapore, he volunteered to be part of the Coronation contingent from the Straits; this contingent went to London when King Edward VII was crowned. During the Great War (World War I), he joined the Veterans’ Platoon where he was attached to the M S V R in Ipoh. Jennings was also a patron of the Perak Chinese Recreation Club (PCRC). While in the club, he encouraged the members to hold a soccer tournament - offering the ‘Times of Malaya Cup’ to the league champions. Jennings was very much interested in civic affairs, thus becoming a member of the Kinta Sanitary Board. Here, he fought for the rights of the Pinji Squatters. His other notable contribution was his concern for Malaria control in the State. During the great floods in 1926-27 Jennings had initiated a public fund for the victims, collecting over $100,000. This money was then handed over to Kuala Lumpur when the FMS started a Relief Fund. Having an immense love for Perak, Jennings always championed for the State. On one occasion, (through Times of Malaya) he pressed that the district of Dindings be returned to Perak - which fortunately occurred during his lifetime. He even called for the removal of the State Capital from Taiping to Ipoh. For the people of Perak (and perhaps Malaya too), Jennings was seen as their ‘mouthpiece’ and as a defender of the people’s rights. Society looked up to him for his persistence and forthright manner. Jennings passed away on 4th December 1936, after suffering a stroke without regaining consciousness. His funeral was held the next day at the Connolly Road Cemetery in Ipoh. The pictures shown are courtesy of Nicholas Jennings (J A S Jennings’ grandson). 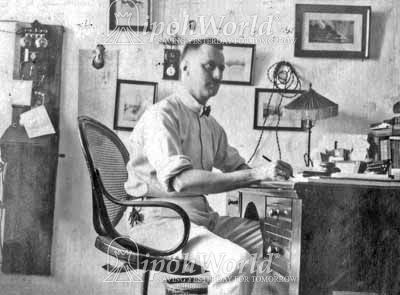 On the left is a self portrait of J A S Jennings, while on the right is Jennings at his Editor’s desk at the Times of Malaya. To read about the Times of Malaya, click here. To read about PCRC, click here.